GABIC is a laboratory focused on the study of Bioinspired Algorithms. Concretely, GABIC is interested in Genetic Algorithms, Memetic Algorithms and Swarm Intelligent Algorithms such as Ant Colony Optimization algorithms. Genetic Algorithms use principles inspired by natural genetic populations to evolve solutions to problems. The basic idea is to maintain a population of chromosomes that evolves through a process of competition and controlled variation. Memetic Algorithms are Genetic Algorithms that apply a separate local search process to refine the individuals of the population. 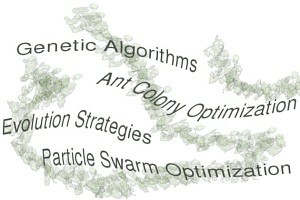 Ant Colony Optimization is a metaheuristic inspired by the shortest path searching behavior of several ant species. Ants are social insects that, thanks to their collaborative interaction, are capable of tackling difficult tasks from an ant's local perspective.